Note: Orders placed within a Sub-Showroom can only be viewed within that Sub-Showroom. They will not be visible from the Master Showroom. Important: When creating a Sub-Showroom with products from a Master Showroom, the products in the Sub-Showroom will count as separate products. For example, if your Master Showroom has 10 products and you create a new Sub-Showroom, the 10 products that are created in the Sub-Showroom by default will be added to the first 10 and your total number of Active Products will be 20. There may be times when you want to create a variation of an existing Showroom without having to build a brand new Master Showroom. Sub-Showrooms allow you to do just that. Sub-Showrooms are nested under their Master Showroom. You can control what aspects of the Master Showroom's product information and Presentations you would like in the Sub-Showrooms. For example, let's imagine you sell in the US and in the UK and you don't want Sales Agents from one region seeing Pricing for the other region. You can set up your Master Showroom for your US region and a Sub-Showroom for the UK region. When you invite Sales Agents into their appropriate Showrooms, they'll only be able to access what is shown in their Showroom and not the other. 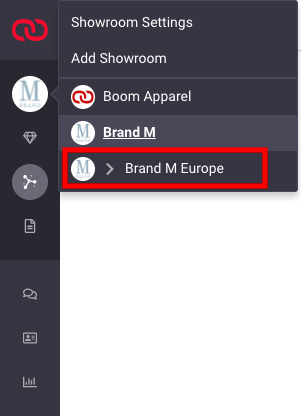 If you have some products you don't want to make visible to all users, you can use a Sub-Showroom to limit what can be seen. Let's imagine you have some styles that you want to sell in an international market but not domestically. You can set up a Sub-Showroom specifically for your domestic viewers and control which Products from the Master Showroom appear inside it.